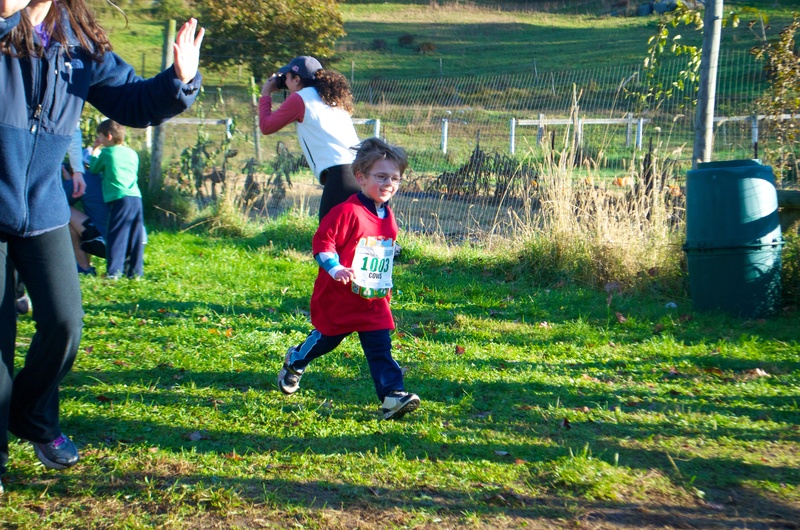 Results are here: 6 & Under • Age 7-12 • 5 mile race (or scroll down). 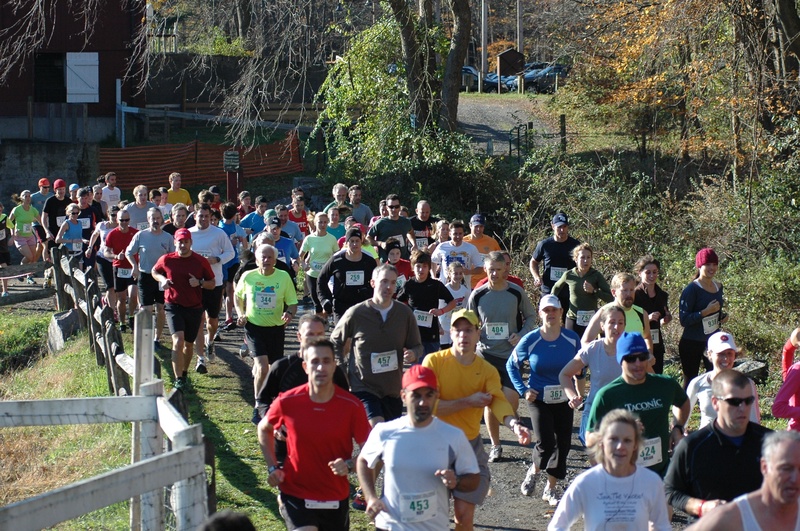 Thank you runners, volunteers, and supporters for coming together for a wonderful day at Muscoot Farm! Remember — the Muscoot Farmer’s market has one more weekend (10/28) before shutting down until May 2013. 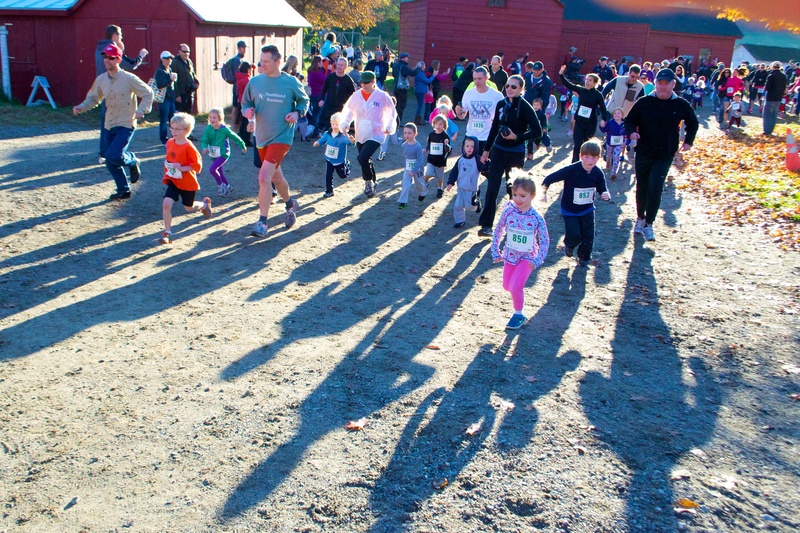 We had a record number of 279 kids finishers at Kids Run The Farm. Congratulations to all participants! Gabriel Roland (5:18*) and Sophie Davis (5:26*) won in the 6 & under race. Casey Wolff (7:33) and Albertine Neal (7:48*) won the age 7-12 race. 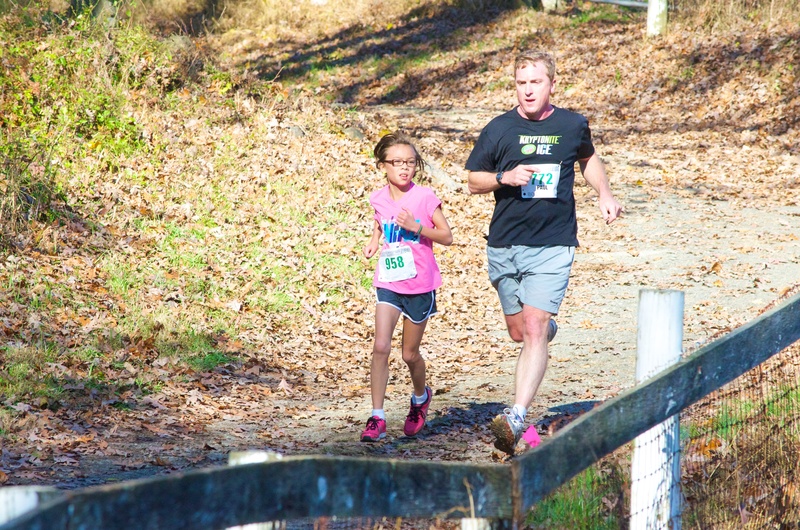 Three new overall course records and ten age group records were set for the kids course on Sunday in near perfect running conditions. In a strong field of 424 finishers, Gerry Sullivan of White Plains three-peated as overall winner of the 5 mile race in a time of 32:14. 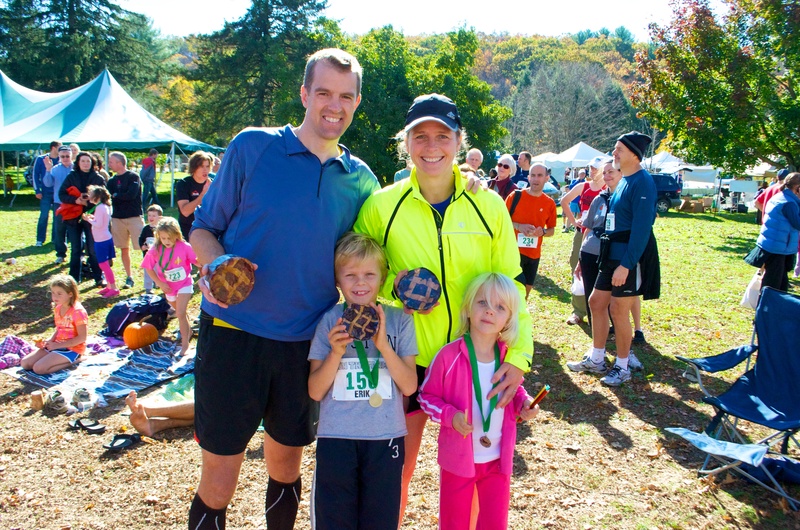 Ann MacDonald of Mount Kisco won her first Run The Farm race with a time of 38:17. Ann and Gerry are both two-time winners of the Leatherman’s Loop. We had two runners (that we know of) registered and finishing both the kids race and the 5 miler to get the first ever “6 mile” awards: Eamonn Sullivan and Nicholas Petrella. Congrats to both boys on a great running day! Thanks to Sue Moga and the fantastic staff at Muscoot Farm for making it a pleasure for all of us to come visit for the day (and come back again and again!). Thanks also to the volunteers from the Somers VFD Ambulance Corps who helped take care of several runners in distress. The winner of the Farm Bucks challenge was Dutch Desserts in the Muscoot Farmer’s Market. They were the most popular recipient of Farm Bucks from the day’s races after we cashed out the farm bucks for real cash. Hummingbird Ranch and Hudson Milk Company were a close second and third. 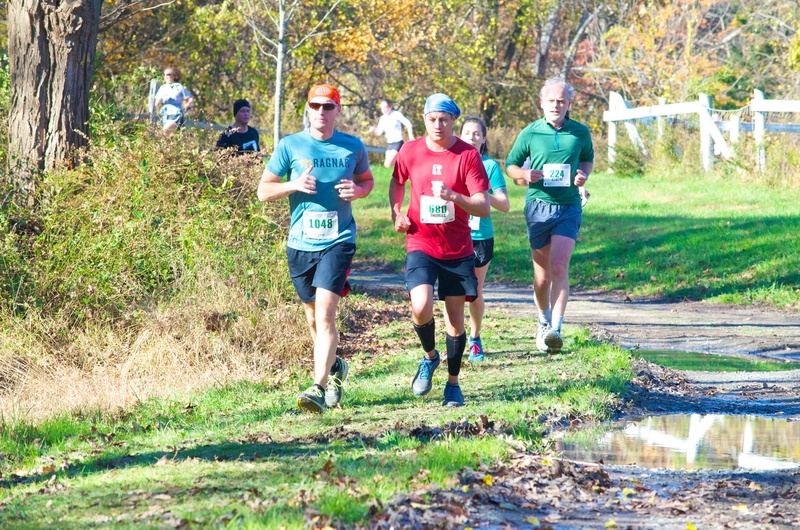 Check out lots of photos from the day at our photo website here: http://leathermansloop.smugmug.com/RunTheFarm/2012 (still uploading as of 9am monday!). If you have any photos you’d like to share please either send it to leathermansloop@gmail.com or if you have lots of photos that might be too big for email, contact us and we’ll figure out how to get them from you. You can also post photos to Facebook and tag Leatherman’s Loop in the photo if you’d like to share that way. 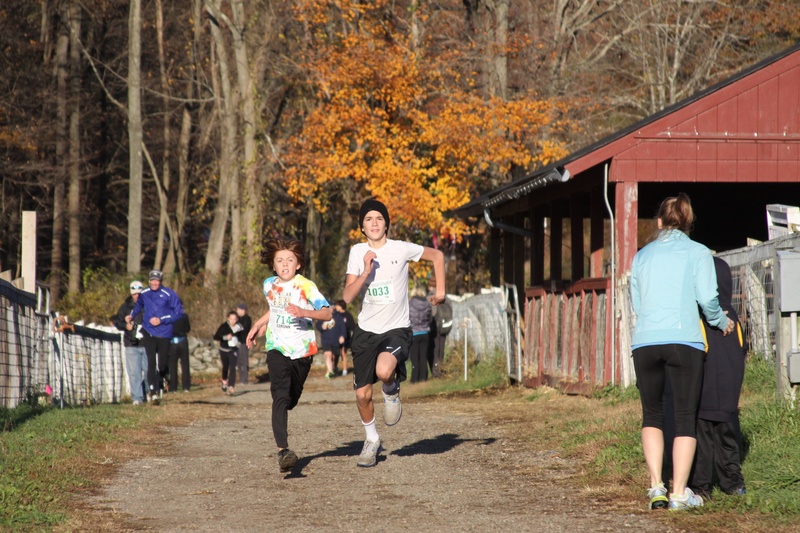 Eamonn Sullivan and Casey Wolff battle it out in the home stretch of the kids race.